We know that when a loss occurs there is a need to do something. Monterey Bay LovedPet staff live next door to our Park so we have staff available 24/7 to answer calls regarding your deceased pet. Feel free to call anytime, day or night if you have had a loss and need assistance. Your call will almost always be answered by a live person, not a voice mail recording. No other local pet cemetery/crematorium offers this level of service. It is not uncommon for a pet owner to “check around” to ensure they are providing the best service for their departed friend. We encourage that.We have been serving pet owners at this same location for more than 50 years. Our Park is rare as it is what is referred to as a “Green Grass” Pet Cemetery with Crematorium. We have in excess of 5,000 pets buried on these hallowed grounds and more join us every month. In the last few years several local businessmen have decided to exploit pet afterlife care strictly for the profit they can glean. How do you know the difference when most everyone refers to themselves as “caring” or “dedicated” or “loving” and so on? Are they honest or do they shade the truth with glib wording? Will they let you be present when your pet is actually cremated? If not, why?- Where are they located? Are they hidden away in a steel or concrete industrial building because of cheap rent or secreted in the mountains far from you? We live by a precept espoused by the late President Reagan: “Trust yes, but verify”. This is your pet so ask the hard questions and don’t accept glib excuses when taking your pet on that final journey. We provide completely private pet cremations at our Park. You will have the exclusive (Private) use of our crematorium for your pet without any others inside. You may bring your departed companion to us or we are happy to remove your pet from your property or veterinarian’s office.This service allows you to be with your dear friend on their final journey and witness as much (or as little) of the cremation process as you wish. We explain everything up front and give you plenty of opportunity to say goodbye. With this special, fully Private service, you are able to bring your faithful companion home the same day in your choice of custom engraved , hand-crafted urns. 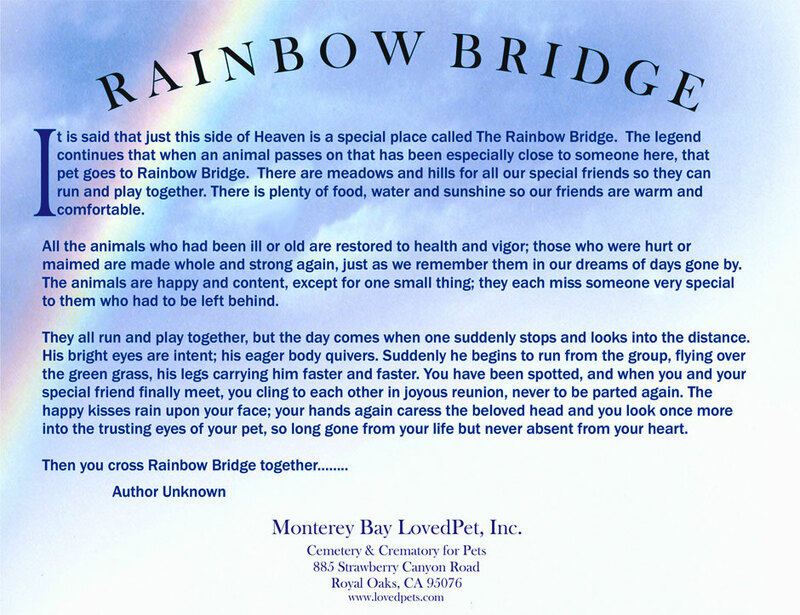 A Certificate of Private Cremation is provided to you along with a copy of the remarkable “Rainbow Bridge” epitaph. Individual cremation services are available for pets of all sizes. You may bring your pet directly to the Park or we will remove your pet from your property or veterinarian’s office. During an ‘Individual’ cremation service your pet is cremated in its own secure space within our crematorium. To reduce our costs of operation and therefore your fee several other segregated pets are also cremated. There is no commingling of the ashes (cremains) of any pet since they are all separate. Our Individual Cremation option offers the same end results as a totally ‘Private’ service at a much lower cost. Whatever service you choose our staff will treat your pet with care and compassion, even if you are not present. Your pet’s cremains will be ready to return home within two to three days in your choice of an engraved urn. A Certificate of Individual Cremation is provided to you along with a copy of the remarkable “Rainbow Bridge” epitaph. Communal (group) cremation services are provided for pet owners preferring to have their pets remains scattered in the Garden of Companions at our Park in the northern Monterey County foothills.A Certificate of Communal Cremation is available if desired. Many pet owners who choose communal (group) cremation also choose a Memorial Plaque on our Wall of Memories at the Park, or another memorial product. Losing a pet is often devastating to pet owners and they can feel isolated in their grief. Family and friends may not know or understand the impact the loss of a pet can have and don’t know how to react to grieving pet owners. 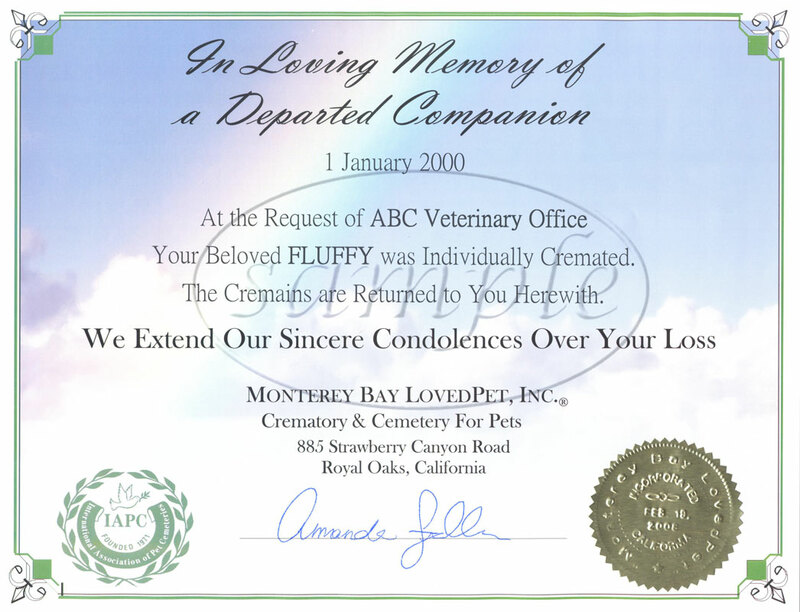 Monterey Bay LovedPet offers comfort and aid to grieving owners by understanding and offering help during a very difficult time. You need only speak with our Licensed on-staff Grief Counselor.